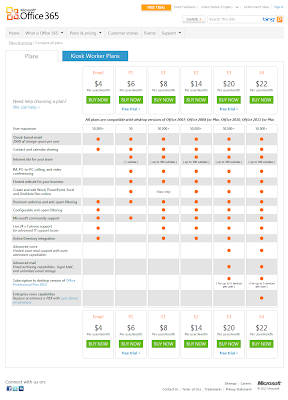 Quite Cloudy by Scott Cameron: Office 365 P1 vs E1 Plans - What Does $2 Buy You? Office 365 P1 vs E1 Plans - What Does $2 Buy You? Phone support 24x7 - this is HUGE. The Office 365 community is great but I wouldn't want to depend on them solely for support for a system critical to the operation of my business. There is NO upgrade to E1 - this one is also BIG. In order to move up to E1 if you need it you need to do another full migration - VERY painful. It's best to avoid this issue even if you're nowhere near the 50 user limit for P1. SharePoint - the version of SharePoint you get with P1 doesn't include its full functionality. You don't get My Sites (individual user sites). Also, you don't get the workflow features and some other bits. Storage upgrades. If you think you'll ever need more than 25GB per mailbox for e-mail storage you need E1. P1 doesn't have any upgrade path to E3 where you get unlimited e-mail storage. E-mail archiving and legal hold - you need Exchange Plan 2 or E3 or better for these. Legal hold doesn't sound like something most people need, but it allows you to force Office 365 to hold on to e-mail for longer periods of time. Since your backup options are limited with Office 365 this is a way to get the benefits of archival backup solutions that let you restore data from previous points in time - a feature otherwise unavailable in Office 365. Office Professional Plus - if there's the possibility that you would ever need the full version Office suite you need to be in the E plans so you can upgrade to E3. Otherwise you'll be stuck on your old Office version until you go pay your $399 per user capital expenditure. $6 per month (the difference between E2 and E3) looks like a pretty good deal in comparison. The only thing you lose going from P1 to E1 is the ability to both view and EDIT documents in Office Web Apps. If you really need to be able to edit you can move up one more notch to E2 for $14 per month instead. $8 per month is a steal for everything you get. You've moved a capital expentiture to a regular operational expenditure that you can budget reliably for. Also, don't be surprised if the price continues to go down and if features are added. These are some of the benefits of expanding market share on a cloud service... you keep on getting more and more for your money.